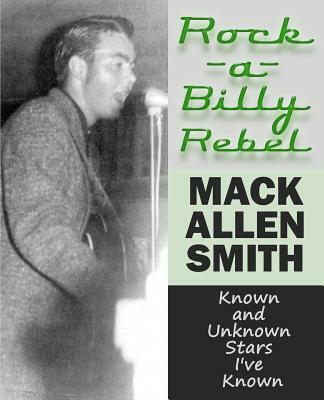 Rockabilly Hall-of-Fame Inductee Mack Allen Smith's latest book is based on his 60+ years career as a honky-tonk singer/writer/recording artist, and the numerous singers, musicians, and writers he has known and shared a stage with during this period. Says Mack, "My objective was to write a book that was different from others I had read in this genre. The ones I'd read were about singers, musicians, producers, etc., that the authors hadn't known personally prior to starting their books. Their only connection to the artists they were writing about was hearing their records on the radio." "On the other hand, my goal was to write about people I'd known and shared a stage with, or at least knew them personally and had first hand knowledge of their careers in music. Having played or sung on a record was not a criteria for getting a spot in my book. Hence, the subtitle 'Known and Unknown Stars I've Known.' Some are known throughout the music world for their accomplishments. Others never made it big in the music business, but, nonetheless, are stars to me.